Evanna Lynch Joins ‘Dancing With the Stars’! 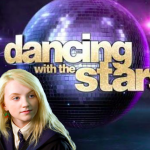 Evanna Lynch better brush up on the waltzing skills some of the actors learned during their days preparing for the Yule Ball in Harry Potter – she’s reportedly the latest contestant added to dance competition show, Dancing With The Stars, expected to be officially announced tomorrow on Good Morning America! Lately Evanna – who portrayed Luna Lovegood in the Harry Potter series – has focused on hosting and producing the first season of her vegan podcast, The Chickpeeps, with co-hosts Robbie Jarvis (Harry Potter‘s Young James Potter), The Protego Foundation‘s co-founder Tylor Starr, and ocean conservation activist Momoko Hill. Evanna also recently appeared in the New York and London runs of Disco Pigs (see photos from her rehearsal below), and in Irish movie My Name is Emily. Be sure to show your support for Evanna during her time on the show – we can’t wait to cheer her on! The 27th series of Dancing With the Stars premieres on ABC Monday, September 24, at 8 p.m. ET. Len Goodman, Carrie Ann Inaba and Bruno Tonioli will judge. Stay posted for updates! UPDATE – Sept 12th: Here’s our first official look at Evanna with dancing partner Keo Motsepe!